Seattle web development and marketing agency, efelle creative, launches two new responsively designed law firm websites. Recently efelle creative launched responsive law firm websites for a large Seattle-based class action law firm, Hagens Berman Sobol Shapiro (HBSS), and an Atlanta-based insurance defense firm, Drew Eckl Farnham (DEF). Both sites are integrated with efelle creative’s legal-focused content management system (CMS), LawFirmFusion. The system was specifically developed with the needs of law firms, and search engine optimization (SEO), in mind. The revolutionary LawFirmFusion system gives legal firms many advantages over traditional website options. Tasks that typically require costly manual labor are automated, such as creating downloadable attorney bio PDFs and practice area brochures. In addition, the system supports a new cases module to track and report on case developments and outcomes, the ability to create and update multiple blogs, distribute email newsletters, and much more. The new website for HBSS includes complex, custom functionality never before seen in a law firm website. This large, class action law firm needed their new site to serve as a primary information source for current and potential clients while providing an easy to navigate user experience and an updated design, supporting their image as a sophisticated, top-tier law firm. With their new site, HBSS has the ability to manage case updates, breaking news, press releases, public-facing legal documents, blog posts, and mailing lists related to each individual case. The site is responsive for multiple screen sizes, and despite the functionality and content volume, load time is not sacrificed. The team at efelle creative worked with HBSS to create a custom solution that is easy to manage and optimizes every page for search engines. Click here to view the new HBSS website. Drew Eckl Farnham was looking to update their site to boost the firm's brand image overall. 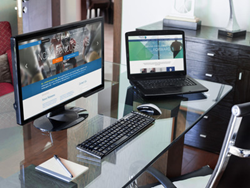 Content management was a major priority for this insurance defense firm website. They needed a better platform to help increase leads and brand awareness while providing the ability to measure the success of their efforts through website analytics. The award-winning design team at efelle media worked closely with the firm to create a modern, culture-driven and brand-focused design. Drew Eckl Farnham's new website was then developed using our LawFirmFusion content management system, which integrates with Google Analytics and provides a cohesive digital marketing experience to help fuel business development and lead generation. Click here to view Drew Eckl Farnham’s new website. To check out other website that use the LawFirmFusion system, visit efelle’s online portfolio. efelle has been specializing in law firm sites for over 10 years with clients around the nation. As an internationally recognized design firm with over 40 employees efelle focuses on custom design, search engine optimization, conversions, promoting online growth and more. To learn more about how efelle can help you firm call 206.384.4909 or contact us here.